BURKA RAMIS, OROMIA, 21 August 2017- In Burka Ramis, a remote rural village of West Hararge, Oromia region, Ethiopia, 50 young boys and girls sing cheerfully in their classroom. It is summer, a school break time for the rest of the pupils, but for these children, it is a regular class session. Beriso Genemo, their teacher, prepares detailed weekly and monthly lesson plans. He decided to join teachers in his school who participate in summer teaching of beginners, because he understands the importance of school readiness, especially for children from rural and disadvantaged communities. This summer initiative is known as the Accelerated-School-Readiness (ASR) programme. ASR is an innovative early learning model that lasts eight weeks and targets six-year-olds from poor families. It provides quality education by trained teachers such as Beriso to help children, who previously had no access to preschool or other early learning models, so that they make smooth transition from home to school. Other ASR teachers, Huseein Ahmed from Nano Bereda School and Adana Geri from Borte School also acknowledge the importance of the programme. They explained that attending the ASR class is helpful because children can learn how to take lessons, interact with teacher and classmates and go to school by themselves. Research shows that investing in quality early learning programmes is one of the most effective ways to improve a child’s success in a school. In Ethiopia, children under five comprise the largest age bracket in the population. There are approximately 10 million children aged 0-3 years, and 7.7 million children aged 4-6 years. Investing in Early Child Development (ECD) interventions, like early learning, is critical for the long-term prosperity of the country. There are other forms of school readiness programmes in Ethiopia, the largest being the government’s “O” pre-school classes. However, ASR is one that fills a crucial gap because it operates in communities where formal preschool classes are not possible, such as in rural areas where it is difficult and costly to provide quality “O” classes. UNICEF through the Swiss National Committee, with generous support from Roche, is currently supporting Ethiopia’s Ministry of Education to develop and implement the ASR programme in four regions (Oromia, Amhara, SNNP and Beningal-Gumuz). Every ASR teacher participates in a comprehensive training and is provided with resource materials (books), as well as individual exercise booklets (workbooks) to distribute to each child. When you travel in a car through Addis Ababa, you will note that adult women and men vary greatly in height. There are tall people and short people. So which ones of these are actually stunted? And why? Scientifically stunting is defined as a reduced growth rate in human development and is a primary manifestation of malnutrition or more accurately under nutrition. The definition of stunting according to the World Health Organisation (WHO) is for the “height for age” value to be less than two standard deviations of the WHO Child Growth Standards median. So how does under nutrition occur? Recent scientific evidence suggests that under nutrition is a result of recurrent infections such as diarrhoea or helminthiasis in early childhood and even before birth. 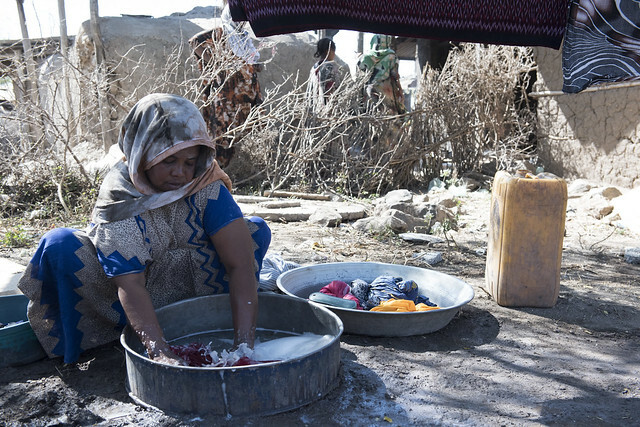 In 2016, UNICEF Ethiopia, published a blog entitled BABY WASH – the missing piece of the puzzle?, in which evidence from a paper published by UNICEF and John Hopkins University in the Journal of Tropical Medicine and International Health highlighted the need to target interventions to reduce unsafe practices of disposal of baby and child faeces. To convert this evidence into action, the Government of Ethiopia, UNICEF and partners have developed a BABYWASH implementation guideline. The guideline aims at contributing to improving Integrated Early Childhood Development (IECD) through improving the baby and child environment. 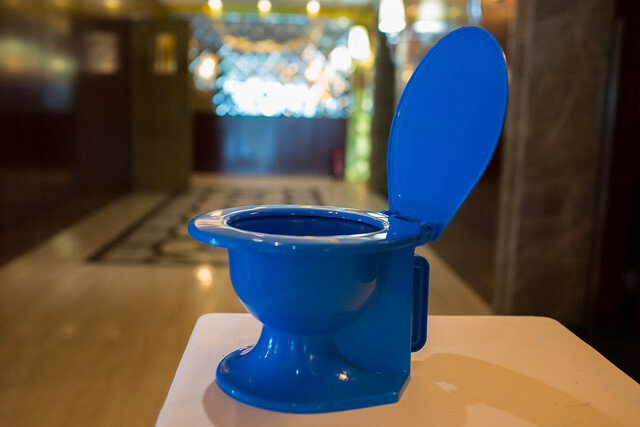 According to the Knowledge, Attitude and Practice (KAP) baseline survey on Water, Sanitation, and Hygiene carried out in eight regions of Ethiopia, there is a general misconception about child faeces disposal. The survey showed that a lack of knowledge on the health risk related to child faeces is a key factor behind poor hygiene practices in faeces disposal. According to the survey, only half (49 per cent) of women knew that child faeces are dangerous to health. Misconception is higher among rural pastoralist women where only 39 per cent said child faeces are dangerous as compared with 50 per cent among rural non-pastoralist women and 54 per cent of women in urban areas. Although it may not be clear who is stunted and who is not just by looking at a child, it’s clear that safe disposal of child faeces helps improve a child’s health. Therefore, UNICEF will continue to support the Government with the implementation of the guideline throughout the country. At the workshop, the national ‘Baby WASH’ strategy, which focuses on hygiene of children under three years, was endorsed by the Federal Ministry of Health. The strategy includes safe disposal of child faeces, providing protective environments through play mats and similar measures as well as prevention of soil transmitted helminths. The strategy will be implemented alongside regular safe sanitation and hygiene practices which are already being promoted by health extension workers. 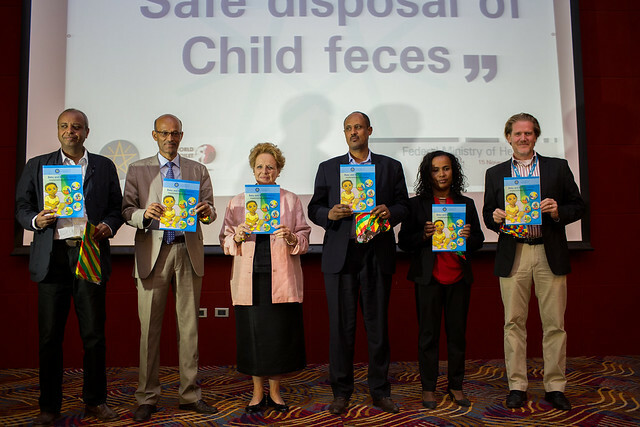 According to the Knowledge, Attitude and Practice (KAP) baseline survey on Water, Sanitation, and Hygiene carried out in eight regions of Ethiopia, there is a general misconception about child faeces disposal. The survey showed that a lack of knowledge on the health risk related to child faeces is a key factor behind poor hygiene practices in faeces disposal. According to the survey, only half (49 per cent) of women knew that child faeces are dangerous to health. Misconception is higher among rural pastoralist women where only 39 per cent said child faeces are dangerous as compared with 50 per cent among rural non-pastoralist women and 54 per cent of women in urban areas. A strong early childhood foundation, which includes a safe and hygienic environment coupled with adequate nutrition as well as nurturing parenting and stimulation for optimal brain development, is critical to ensure toddlers can develop to their full potential. This will facilitate a smooth transition to primary school and a better chance of successfully completing basic education. Therefore, investing in early childhood development through improved hygiene practices and environments is one of the most critical and cost‑effective ways to improve a child’s future health, education and productivity. The Ministry of Health and UNICEF urge citizens, parents, teachers, health workers, policy makers and government officials to play their role in making sure that every child receives the benefits of Water, Sanitation and Hygiene (WASH) in their homes, communities, schools and health facilities. Sekota, AMHARA, 21 June 2017- Meet Netsanet, a strong and independent 25-year-old mother who is very self-assured; reminiscent of her name, which means ‘freedom’. When we visit Netsanet in her house, it is a typical morning for her. First, she waters her home garden: cabbage, carrots, tomatoes and other vegetables. The seeds were provided by FAO with funding from the European Union through the woreda (district) agriculture office as a support for her family to have balanced meals. Her next task is feeding her chickens, from which she uses eggs for cooking and as a source of income. She sells eggs on Thursdays at the nearby Hamusit market. She then starts preparing breakfast. She takes fresh vegetables from her garden; a couple of eggs, milk, mixed grains and starts to cook the meal for her daughter. Netsanet has two daughters, Mekdes age 5 and in kindergarten; and Tsige age 2. Netsanet explains the difference between her two pregnancies, birth and the girls’ first two years of life. “I had my first child at home, as we did not have awareness. I was lucky that I did not face any complications when I had her. If something bad had happened, I would have regretted it,” says Netsanet. This is not the only work Netsanet has. She is also a member of the health development army (HDA), a strategic network the Government has galvanised to reach rural communities. As part of the Government’s intervention, health extension workers train women from the community to become HDA members and drive health-related behaviour change, including breastfeeding and child feeding practices, within their communities. Netsanet is a leader of five teams that each consist of five women- a ‘network’. Netsanet and five additional network leaders are supervised by a health extension worker. Mothers meet to discuss twice a month. They meet at the health post to demonstrate how to make food for children. They bring whatever food stuff they can find at home such as eggs, flour and milk, then they cook and feed their children. 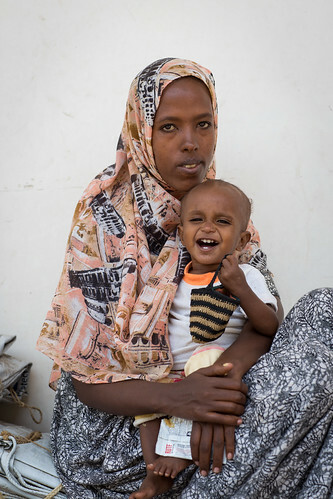 The Government of Ethiopia has placed malnutrition high on both the political and the development agenda over the past decade. As a result, bold actions have been taken in health and other nutrition-related sectors, putting in place policies, programmes and large-scale interventions to significantly reduce malnutrition among the most vulnerable groups: young children and pregnant and lactating women. 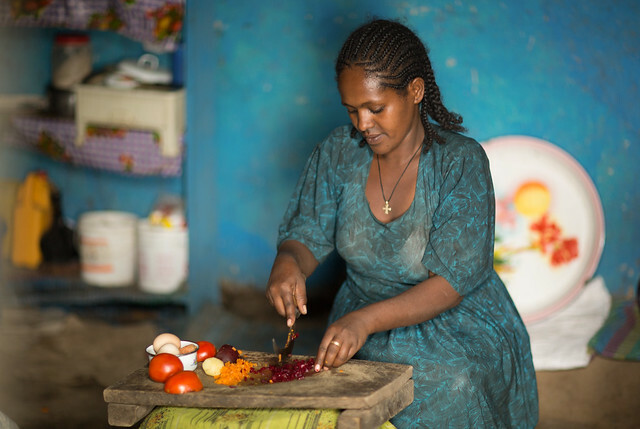 The EU- SHARE project addresses gaps in implementation of the National Nutrition Programme while strengthening nutrition outcomes of major health, food security and livelihoods Government programmes. The primary focus is on the first 1, 000 days of a child’s life, in order to accelerate the decline in stunting. 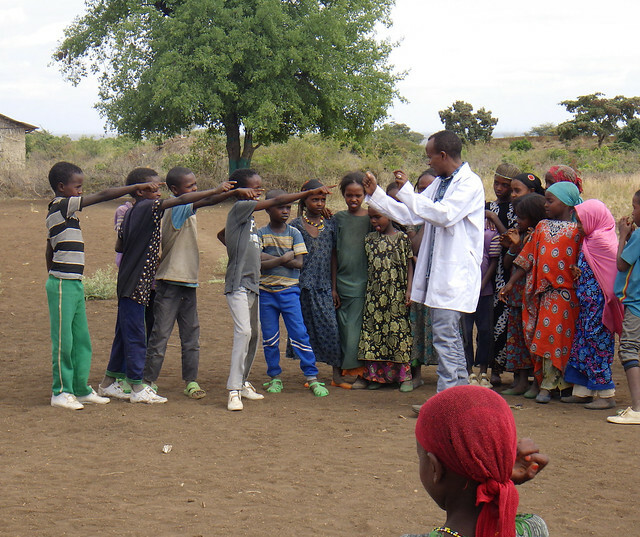 Sekota is the woredas targeted by the project and has received support with an aim to enhance quality and uptake of nutrition services being delivered to the community. This is done through building the technical capacity of health workers, improving availability of nutrition supplies and sensitizing community members towards proper infant and young child feeding practices. These interventions have a significant impact in the overall reduction of child malnutrition, especially through contributing to the improvement of nutrition and dietary diversification practices for adolescent girls, pregnant and lactating women, and children younger than five, just like Netsanet and her girls. NEW YORK/ADDIS ABABA, 6 June 2017 – Stars from the world of entertainment and sport including Mahershala Ali, David Beckham, the All Blacks, Daniel Cormier, Novak Djokovic, Lewis Hamilton, Hugh Jackman, Sachin Tendulkar, Thalía, Chris Weidman, Teddy Afro and Gebregziabher Gebremariam joined Super Dads, a new UNICEF initiative launched today to celebrate fatherhood, and highlight the importance of love, play, protection and good nutrition for the healthy development of young children’s brains. “Children need the love of their parents more than anything,” says Tewodros Kassahun, a well-known Ethiopian singer. “I always try to be a good father. I love playing with my children. Intimacy and love are more important than anything,” adds Teddy who is also known as Teddy Afro. 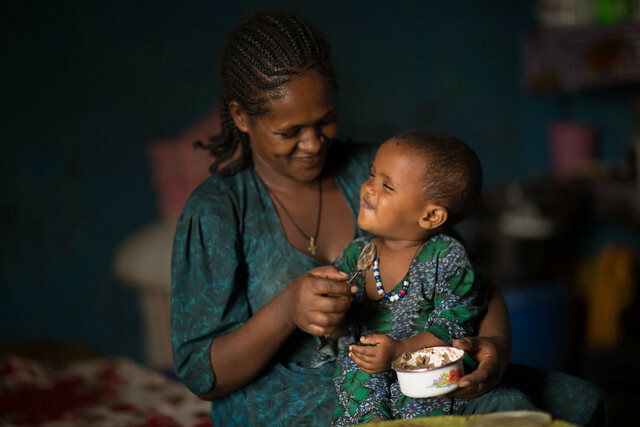 In Ethiopia, many families are unaware of the significance of early childhood care and education for a child’s development, including the effects of appropriate nutrition, playtime and family care in an environment safe from violence. UNICEF is working for children aged 0–3 to receive adequate nurture and stimulation through an integrated and sustainable approach to quality early child development interventions that include health, nutrition, protection, early stimulation, school readiness and WASH.
MIESSO, SOMALI, 15 January 2017 – “When the borehole was broken for a year and a half, I used to go to the nearby river for water, which is 12 km away from here. I have five children but I only managed to get one or two jerry cans of water for my family. I was not able to clean or bathe my children regularly at that time. That was difficult,” says Fathiya Ali Aadan, a 32-year-old mother of five living in Miesso town. Miesso is a small, remote town in the same-named woreda (district) located about 150 km west of the administrative city, Dire Dawa. Out of five non-functional water supply systems in Miesso woreda, one borehole was rehabilitated in the town by the Regional Water Bureau (RWB) in December 2016 with assistance from UNICEF, from the generous support of the Office of U.S. Foreign Disaster Assistance (OFDA). The emergency water, sanitation and hygiene (WASH) intervention benefits 3,500 households in the town as well as the school and health centre. The Miesso woreda administration office reports that there are currently 86 non-functional boreholes in the woreda, a key intervention necessary to improve the water situation, which is only one part of the challenges facing families in the region. Since most of the region is prone to drought and pastoralist livelihoods critically depend on water, non-functionality of water schemes requires immediate response to save lives of people and their livestock. It also affects children’s opportunity to learn. At Mulli School, which includes grades one through twelve, a 14-year-old, grade eight student Ibrahim Mohamed explains, “Before, we had to return back home to get water when there was no water at school. It was a big interruption of class.” The impact of water scarcity also causes some schools to close, such as last year after the failure of deyr rains (October-December). Additionally, pastoralist families may move in search of water, thus taking children and even teachers away from school. “Now we can drink water, keep our clothes clean, wash our hands after using the bathroom and most importantly for me, there is no longer need to go back home to get water during class. Girls need water for menstrual hygiene at school as well,” says Hayat Yusuf Adan, a 13-year-old, grade eight student. Thanks to the rehabilitated borehole, Hayat’s school managed to remain open. While water supply at school tends to be neglected during emergency, it is clear that water availability contributes to retaining children in school. UNICEF is committed to support the Government of Ethiopia and implementing partners to improve the WASH situation for schools and families across Somali region to protect the futures of children and the livelihoods of their families. ‘Children are today’s flowers and tomorrow’s fruit’ is a saying in Ethiopia and there is no better investment that cultivates the fruit and speaks to the ‘right in principle and right in practice’ mantra more than early childhood development. Parents and communities want the best for their children and understand that the early years of a child’s life are crucial. However, they may not have the means or the knowledge on how to ensure their next generation best thrives. Last week, the latest offering from the world-renowned Lancet, Advancing Early Childhood Development: from Science to Scale, showed that almost one in two – 43 per cent – of children under five in low-and middle-income countries are at risk of not achieving their cognitive potential. No country can risk losing nearly half of the brain potential of its youngest citizens – low- and middle-income countries least of all. Advances in neuroscience show that experiences in early childhood have a profound impact on brain development and on subsequent learning and health. Children who are poorly nourished and nurtured, or those who do not receive early stimulation, are likely to learn less in school and go on to earn less as adults. In Ethiopia, over 5 million children are stunted which has a serious impact on human development and economic growth. And currently, the most disadvantaged children in rural and hard to reach communities are either coming to grade 1 without having the necessary preparation or are enrolling late – under 40 per cent of children in Ethiopia have access to pre-school provision. Once in primary education, many are at risk of dropping out of school too early. The good news is that early childhood development interventions, including parenting and care programmes, cost as little as 50 cents (US$) per child per year, when combined with existing services such as health – according to the Lancet Series. And much of what needs to be done at the community level can be achieved by mothers and fathers, grandparents, siblings and caregivers. The findings in the Series underscore the importance of increased global dedication to early childhood development. Earlier this year, World Bank Group President Jim Yong Kim and UNICEF Executive Director Anthony Lake signalled a renewed commitment to prioritizing investments in the youngest children when they announced a new alliance urging global and national leaders to step up and accelerate action and funding for nutrition and early childhood development (ECD) programmes. The Lancet estimates that individuals who suffer a loss of about a quarter of average adult income per year, while countries may forfeit up to as much as two times their current GDP expenditures on health or education. Consequences of inaction impact not only present but future generations. When children have the opportunity to develop their cognitive capacity, they will pass similar or even better opportunities to their children when they grow up. Increasing investment in Ethiopia’s young children can break the vicious cycle of intergenerational poverty. Nobel Laureate James Heckman found that the rate of return for investments in quality early childhood development for disadvantaged children is 7-10 per cent per annum through better outcomes in education, health, sociability, economic productivity and reduced crime. This year, the importance of interventions in early childhood was also recognized by the inclusion of an ECD target in the Sustainable Development Goals – indeed, this is the first time ECD has been explicitly included in global development goals. SDG Target 4.2 aims to increase the percentage of children under 5 years of age who are developmentally on track in health, learning and psychosocial well-being. For many children, lack of educational support at home is one of the biggest obstacles to reaching their full potential. In light of differing needs of families, a range of early childhood education services are offered in Ethiopia, including kindergarten, pre-primary class (‘O-class’) and several school readiness programmes. Parenting education programmes are also provided so families can learn about the importance of early nutrition, hygiene, care and stimulation. The evidence presented this past week, combined with the current momentum globally, speaks for itself. We are well versed in the elements that affect the development of children’s brains – good nourishment, stimulated minds, and protection from violence. It is now vital that we use this growing body of evidence to effect real changes for children, at both the community and policy levels. Early child development has to be put on the agenda for children’s rights. In Ethiopia, UNICEF, with the support from partners, takes an integrated approach to addressing early childhood development within Ethiopia’s Early Childhood Care Education Policy. We owe it to our future generations to prioritize and invest in young children. It is our moral, economic, and social imperative to enable all children to reach their full potential.